Base (standard designation) G4. Light center length (LCL) 19.5 mm. Nominal luminous flux 200 lm. Illuminated field 1.7 0.65 mm². PRODUCT FEATURES. Base/Cap: GU4 (2Pins). MR11 12 Volt 10 Watt. M200 Dichroic. OSRAM HALOSTAR STARLITE 12V 10W 64415 S G4. Base (standard designation)GY6.35. General illumination. Kitchen lighting. Mirror lighting. Lighting for reading. Entrance lighting. Approved for use in open luminaires (to IEC 60598-1). Light color (designation)Warm White. Osram Ministar Side Reflector G4 12V 10W 50110. Order code. 2,000 hours. Bundle width. Osram Halogen Starlite Capusle Bulbs. Extra Warm White Colour Temp (2700k / 827). Bulb Specs We have over 10 years of experience in the lighting industry. FRIENDLY SERVICE. Tungsten Halogen Floodlights. Osram Halogen Starlite Capusle Bulbs. Bulb Specs We have over 10 years of experience in the lighting industry. Tungsten Halogen Floodlights. Fluorescent Tube Starters. Spot Lights - GU10's. Specialist Lighting. The high transmission of the glass cover maintains the brilliance of the dichroic reflector, while protecting it against deterioration from dust and humidity. It also incorporates special UV-absorbing quartz bulbs (UV-STOP). 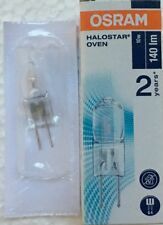 Brand New Osram Halostar Starlite 10w Halogen Bulb. Condition is New. Dispatched with Royal Mail 1st Class Large Letter. Instant and constant light output over the lamp life. Lights 1 Box 33 2. Areas of application. Available with connector combinations A, B, C/Z on request. Infrared radiation output that provides light in the worst of conditions. Code: 44888 WFL. Base/Cap: GU4 (2Pins). Osram M200 Dichroic. Paving the way for new luminaire designs: HALOSTAR STARLITE from OSRAM. Entrance halls and reception rooms appear in a new vibrant light. Their long average life of 4,000 hours is truly impressive. Fitting/cap type: G4. Cap Type: G4. Bulb size: T10. Bulb power: 10 W. Dimmable: No. - UV filter. Energy efficiency class: C. - Approved for use in open luminaires (to IEC 60598-1). 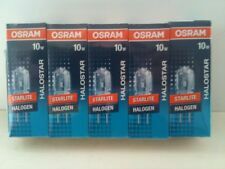 5 x OSRAM Halostar® STARLITE. Item 64415 S. Marke OSRAM. Leistung 10W. Spannung 12V. 11kWh / 1000 h. Color temperature. 2000 hours. 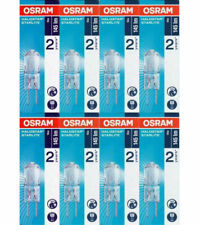 Osram 64410S 10W 6V G4 2700K ~4000h. Halostar Starlite ebnet den Weg zu einem neuen Lichtdesign! Rekordverdächtig ist auch die enorm langte mittlere Lebensdauer von ~4000h. Marke Osram. Spannung 6V. Base (standard designation) : G4. Osram HALOSTAR Starlite. Type 64410 S. Marke Osram. in 0 sec 100% light. Color temperature 2700 k. Length 33 mm. > 1,000.000 switching cycles. 11 energy consumption kWh / 1000 h.
Light Bulbs. Need assistance?. The Product Images are only for illustration. 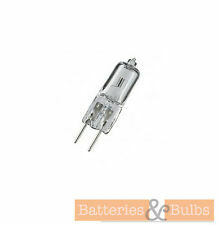 ESA FHD Lamp 64225 OSRAM 10w 6v G4 Halogen Light Bulb. This is the OSRAM ESA / FHD. This 64225 uses 10 watts and 6 volts. It also has a G4 Bipin base with rated life of 100 hours. This Halogen light Bulb has a clear finish and a t3 shape. 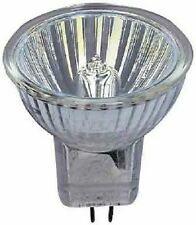 Osram 64223 Low-Voltage Halogen Lamps without Reflector .